If you have a backyard space and a pond and are looking to add some intrigue and interest to it; submersible pond lights might be a worth investment. By illuminating the water in the pond, you can create an amazing array of different reflections and make your backyard look stunning. Whether you’re trying to pick the best pond lighting out of hundreds of different options; or you are simply looking for an innovative and practical way to provide extra lighting for your home – you’ve come to the right place. As well as highlighting what we believe are the top 5 best submersible LED pond lighting kits, we will also provide you with practical advice and tips for deciding what the best ones for you are. Remember That Safety Always Comes First! Jebao Co. Ltd is a very reputable and successful manufacturer of pond and aquarium accessories including pumps, filters, water features and lights. They have been in business since 1998 and have constantly produced innovative, high quality and high-performance products. The Jebao Submersible pond light comes with 3 individual lights that produce a nice cool white illumination that is powered by a total of 1.6 volts. They are set inside highly waterproofed material that allows them to safely be submerged under water. These are very cost-effective and come with the official Jebao branding which attests to their high quality. You even have the option of using three alternative colors with the handy lenses. Next on our list is the highly affordable and practically designed MUCH Underwater Light. This is a fully submersible spotlight that consists of 36 powerful little LED bulbs that produces a very vibrant and rich color. The light will sit under the water safely, thanks to the waterproofing grade of IP68 it has been designed with. Furthermore, the 36 LEDs housed inside the light produced an amazing mix of different colors running through 7 different patterns every 1 to 2 seconds. So, your pond never has the same illumination for very long. Another great feature of the MUCH Underwater Light is the fact that the jointed stand that holds the light has been designed to accommodate positioning the light at various points through a full 180 degrees. As well as increasing the variety in terms of lighting that is open to you, it also makes it that little bit more flexible and versatile, meaning it can be placed and set-up at various angles, on both horizontal or vertical surfaces. Because it is constructed from ABS engineered plastics, it does not include anything harmful or toxic ingredients making it 100% safe for fish, adding to the eco-friendliness that goes hand in hand with LED lighting in general. The next lighting solution we are going to discuss is the COODIA Solar Powered Underwater Night Light. First things first, we have chosen this because it is powered by solar energy, which is collected by the panel that is included with the set and then set to the battery where the solar energy is converted into electricity. When darkness falls, a sensor switches the lights on to provide illumination for your pond or wherever you have it set-up. The fact that it relies on solar energy to power the lights (curious as to how do solar panels work? ), makes it very eco-friendly. So, if you are looking to save some money on your utility bills, but want to turn your backyard pond into an aesthetically pleasing focal feature, this is a great choice in lighting fixture. This set includes three different LED spotlights that all have the ability to change through 6 different colors. Similarly to others on this list, the lights have also been housed in sturdy and long-lasting material that has also met the waterproof rating of IP68, the highest of its kind in America. So, they are completely submersible. Like the light above, these lights also have stands that can be adjusted through a full 180 degrees and further to this, the lights themselves can be adjusted through a full 90 degrees. When you consider the fact that they are not connected to any wiring and can be adjusted a considerable amount, means that you can place them virtually anywhere and in any position. Even the solar panel itself can be adjusted to find just the right angle to absorb as much of the sun’s rays as possible. Was not able to find any negatives, apart from the fact that it might not suit people with lots of shaded areas. From Creative Design, the next on our list are really cool solar pond lights with a rather quirky design. The light is fully adjustable through 90 degrees, but the solar panel can actually be adjusted and set through a full 360 degrees, increasing the flexibility and versatility of where it can be placed. Even though it is a little lower when it comes to its waterproof grade than other items on this list, it is still enough to allow it to safely be submerged in water. Something that does make this particular light stand out from the crowd is that it can not only be charged by the solar panel, it can also be connected up to a USB charger to charge it. This is ideal for those days when there is poor visibility or the sun just isn’t in the sky enough, but you still want to benefit from the beautiful illuminations that this lighting is capable of producing. On the subject of the actual illumination this light produces, it is capable of emitting either strong and bold lighting or dimmed lighting and this is in a wide variety of multiple colors. Considering the fact that it is relatively low priced and solar powered, with the option to charge it by USB; we think you should give it some serious consideration. The last LED pond light on our list is the Honfeng battery operated pack of 4 submersible lights. Each of the 4 lights are capable of producing 16 different colors, including red, green, blue, white and a full variety of combinations. You also have the option for 6 different lighting options, making this a truly versatile and adjustable solution to illuminating your pond. Thanks to the fact that it is battery operated, you do not have any cables or even solar panels to worry about. Simply pop 3 AAA batteries in, place it where you want it and turn it on for the perfect way to draw attention to your beautiful pond as the evening draws in and darkness falls. It could be that this is an item better used for more temporary lighting applications, such as parties and other gatherings as there have been problems noted with it being left in the water overnight or longer than 10 hours. There are important factors you need to keep in mind when looking at all the different types of pond lighting available on the market, that will help determine which is best for you. In the guide below you will find advice about the most important aspects of submersible pond lights, that will help you make the right purchase. Do you need to know how to install pond lights? When it comes to the lighting a pond, the general rule of thumb is – the deeper and larger the pond is, the more powerful the lights you use need to be to provide it with suitable illumination. Make sure that you check the power rating/wattage of pond lights instead of the actual size though. Size is never a very reliable indication of how powerful and bright light will actually be. Although this will obviously depend on your preference and the color of lighting you want for your pond, most pond owners tend to invest in LED lights. This is because they require a lot less in terms of maintenance compared to more traditional bulbs and lights. While they may cost a bit more upfront, they offer an exceptionally high return on investment as most LED lights are designed to last for many years. There was a time when you really only had one choice when it came to the power source for your pond lights – wired connection to a mains electrical outlet. While this is still a very good choice, thanks to the constant supply of power it will provide, solar power is a suitable and cost-effective alternative. The thing you need to be aware of is that solar pond lighting tends to be made to a lower standard of quality. This is mainly due to the fact that they are often used more as temporary fixtures and not permanent lighting solutions. That being said though, this is a very convenient and affordable form of energy. For starters, they don’t need to be placed according to the length of the cord, as they are cordless and can be set-up anywhere. On the other hand, even though the power they produce is greener, the power and brightness they provide are not nearly as good as the alternatives. Battery powered pond lights are another option. Although, due to the constant need to recharge or replace batteries, this is probably better suited to a temporary pond light use. Whether particular pond lighting kits are easy to install or not is another important factor to consider, as no koi pond lights are made equally. It really depends on how much work you want to do and the quality of lighting you want to have in your pond. Battery and solar powered pond lights are far easier to install than those powered by your electricity supply. This is another important aspect that will largely depend on your own personal preference and taste. you need to note that solar pond lighting needs to be placed to ensure they receive as much sunlight during the daylight hours as they possibly can. You also need to be aware of the buoyancy of the pond LED lights you are interested in, if you are looking to set them inside the pond, submerged. It may be that you need to use a weighted item of some sort, like a piece of concrete, a brick or stone. Drill a hole inside the weighted item and attach your light to it before you place it and this will prevent it from bobbing on the surface of the pond. Particularly if you are working with lighting connected to your mains electricity supply, you need to ensure that everything is switched off when you are handling the cable. You should also be sure that the electrical pond lights you use are grounded. Safety should always be a priority. We have based our selection of products on the customer reviews, their ratings and the actual features of the lights themselves. Before you go, we thought it might be a good idea to give you some further help as many people are often unsure where and how to install pond lights to get the maximum benefit for them. Not only that, some people have been known to place them in the worst places or do other things that can either be ineffective or dangerous. Therefore, please take a look at some of the extra tips below for in-pond lighting before you settle on the pond lighting kit you are going to buy and definitely before you decide where you are going to place or set them up. You should make sure that you always buy lights, and anything else electrical or involved with water use and electricity, from reputable sellers or dealers. Even though price and brand names are not always a sign that a product is better, because you can often find non-branded lights that work just as well as the higher priced models that you may just be paying for the name. Always follow the instructions and directions as they are noted in the manual that comes with your lighting kit. As underwater lighting powered by electricity tend to rely on low voltage cabling and a transformer, the combination of electricity and water is safe. Further to this, because these lights are generally designed to be submersible, they are sealed tightly and securely to ensure no water leaks in. The above does not mean you need to negate the use of some common sense. If at all possible, decide where you are going to set up your pond lights when you are planning the design and construction of the pond, as this will make it much easier to install them without having to drain water and then refill your pond. Even if you have to do it after your pond has been set up, you should consider illuminating the water cascading down from a water fountain, if you have one. Alternatively, you could also place the lights around the edge of the pond and have them pointed towards a central feature, to form a nice focal point. In addition to any submersible pond lights you set up in your pond, you could also consider using some floating lights. The advantage of floating lights is that they are much easier to position and less time-consuming to set up. 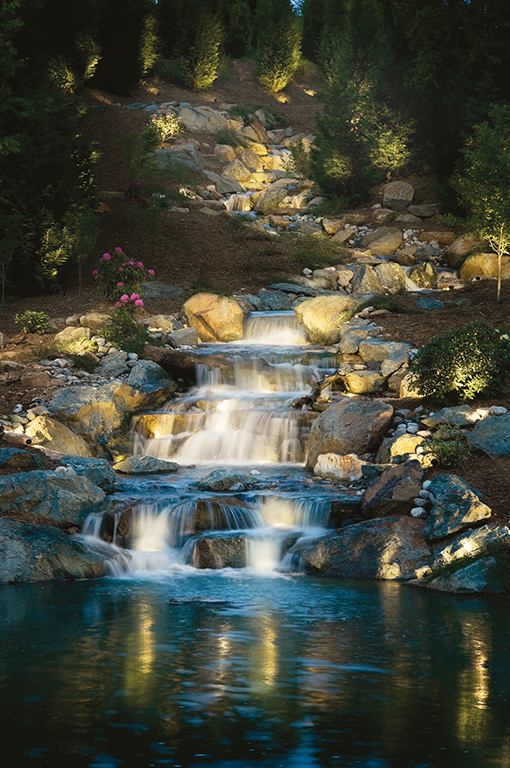 When you are using lighting for a water fountain in your pond, you need to make sure that both the pump and fountain are both secured to a flat surface inside your pond. You will find that some pond light kits come complete with a mechanism that enables them to be attached easily to the pump on a fountain system. Only use outdoor lighting in pond that is designed to be used outdoors. Following on nicely from the above, you will notice that a transformer has been mentioned a number of times throughout this post. We can’t stress enough how important it is to make sure you use a transformer with pond lights to make sure that the level of electrical power is kept to a safe level. Whether you decide to use pond lights powered by solar power, mains electric or battery is up to you. Either of these, as you have likely seen, have their own unique benefits. Don’t be alarmed or put off by the reminders about the safety required when using electricity and water, because if you follow obvious safe working practices, you are going to be alright. Sometimes electrical lighting solutions for a pond are the best. Remember that designing and decorating your pond so that it stands out should also be a fun experience, so make sure you enjoy it. By doing the legwork now and putting in the research and not rushing into a purchase, you will reap the rewards of a stunning pond with perfect illuminations that will transform your nice, but rather plain backyard into a whole new world.